Select main navigation style – control the general width of your site main navigation menu. Select main navigation behavior – select the menu behavior when scrolling down the page. Menu font settings – control the typography settings of the menu. Navigation background color – select the background color for the fixed menu bar. Navigation text color – select the default menu text color. Navigation text color on mouse over – select the default menu text color on mouse over. 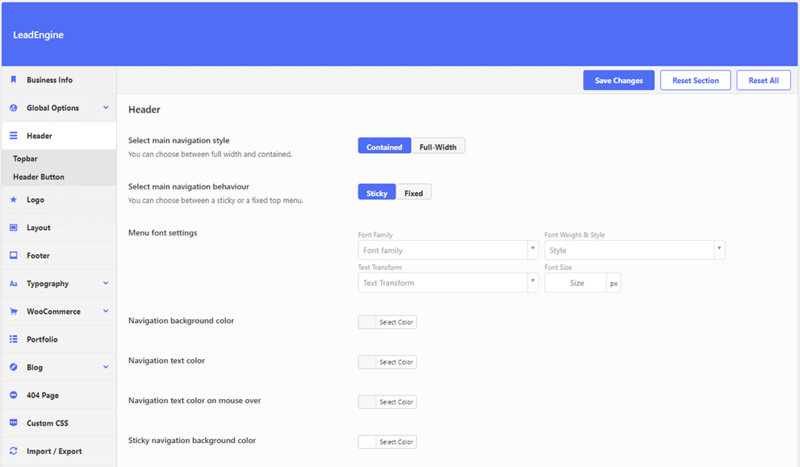 Sticky navigation background color – select the background color for the sticky menu bar. Sticky navigation text color – select the sticky menu text color. Sticky navigation text color on mouse over – select the sticky menu text color on mouse over. Navigation text color – select the menu text color when the transparent navigation option is enabled.